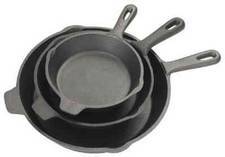 Seasoned Cast Iron can be considered the “grandfather” of today’s “non-stick” cookware. If looked after well it will last a life time. Coat the pan with a solid vegetable shortening. Use either bacon grease or lard as that is the way as liquid vegetable oil leave a sticky surface and the pan will not be properly seasoned. In 15 minutes, remove the pan & pour out any excess grease. Place the pan back in the oven and bake for 2 hours. Repeating this process several times is recommended as it will help create a stronger “seasoning” bond. When you first use the pan cook foods high in fat, such as bacon or foods cooked with fat, because the grease from these foods will help strengthen the seasoning.